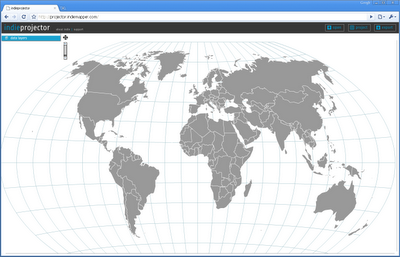 I'm waiting for a geobrowser capable of showing KML maps in different projections. 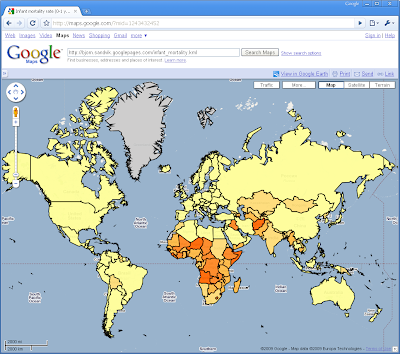 The projections commonly used by geobrowsers are not the best choice for thematic world maps. Many cartographers dislike thematic maps rendered on virtual globes, and the Mercator projection is not suited for large area maps. Greenland looks like the same size of South America, while it is actually 8 times smaller. The coordinate system of KML is geographic (latitude/longitude) coordinates on the World Geodetic System of 1984 (WGS84) datum. Geobrowsers use different projection techniques to render a KML document. Google Earth uses a General Perspective projection, which is similar to the Orthographic projection (see Larry Moores informed speculation of the Google Earth projection). Google Maps and Microsoft's Live Maps both use Mercator projection, which is a good choice for a map that can be panned and zoomed seamlessly. My favorite projection for world maps is Winkel Triple, which is the standard projection for maps made by National Geographic. How can I display my KML based thematic maps in a Winkel Triple projection? Axis maps recently announced indieprojector. This is a web service (based on Adobe Flash) that allows you to (re)project KML files and export the result as SVG. I tried the service with one of my choropleth maps from the Thematic Mapping Engine. The above image shows my KML file in Google Maps using the Mercator projection. Indieprojector nicely and quickly projects my KML file, but the service is not preserving colour styles. When will we see a Flash based KML viewer capable of showing KML documents (with styles!) in various projections? And what about raster data - is Flash capable of converting image tiles into a seemless Winkel Triple projection?